NOTE: RADIO MUST BE IN ORIGINAL CHANNEL CONFIGURATION. ALL CHANNEL MODS MUST BE REMOVED AND COMPONENTS RETURNED TO ORIGINAL CONDITION. DX979, 929, 919, Replace X3 with the enclosed xtal. Refer to figure 1. If your PLL IC is labeled like the one in this pic “RCI 8719-97” we recommend you replace it with an “RCI 8719-99” or an "MMB8719" for full coverage. In both cases, RA1's common pin goes to +5 volt hole (pull up). Take note of the connector labels. CAUTION! Connecting your radio to the wrong set of connectors could permanently damage your radio!! 1. Remove bottom cover. If you want to change the crystal, remove the top cover as well. 2. Unplug the multi colored cable, that comes from the channel selector board, at the main board. 3. Plug the loose end into J1a for the 979 chassis of the LesComm board. 4. Connect the cable from J3a for the 979 chassis of the LesComm board to the connector on the main board you just unplugged the channel selector from. 5. Find a suitable place to install the band switch and the 10kc switch and mount both. 6. 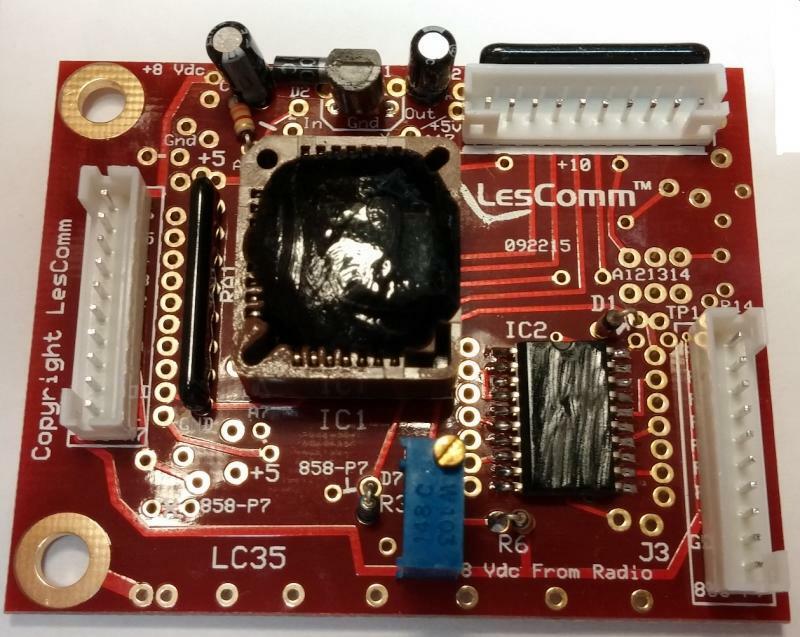 Mount the LesComm board. 7. Connect to power and power up the radio. STOP - Check for operation through all bands. If all is well, go to alignment section. If not, proceed to step 8. 8. Place the Band switch in the D (4) position, channel selector on channel 1. 10. 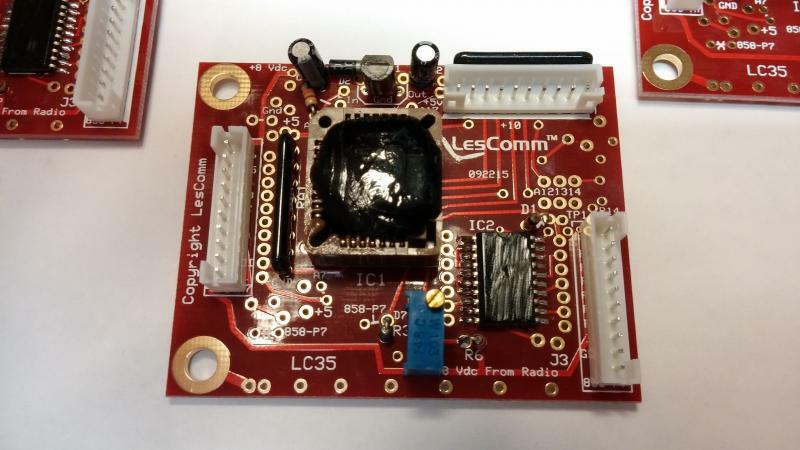 Connect the voltmeter to test point 1 (Cathode of D1) on the LesComm board. 11. Adjust VR1 to match the voltage you measured on pin 17 of the PLL, minus .3volts. Example; If you measured 4.65 volts on pin 17, set VR1 for 4.35 volts at TP 1. Note: If using an MMB8719, set voltage .75 volts below pin 17. 12. Check for 27.41X. If not 27.41, repeat steps 9 through 11. Use the alignment drawing below for adjustment locations. Switch to Band C, channel 1, Clarifier at the 12 o'clock position. In the AM mode, adjust L20 for 26.9650 mhz. In USB mode, adjust L21 for 26.9650 mhz. In LSB mode, adjust L22 for 26.9650 mhz. Switch to Band A, channel 40. While measuring the voltage on pin 8 of the PLL, slowly go down in channels until this voltage becomes unstable and drops off. This is the lowest frequency the radio will cover. Usually around 26.325 on the 8719-97 PLL radio’s. 26.065 on the 8719-99 radio’s. Side Note; The RCI8719-97 is a 7 bit device, but the internals of the IC do not allow it the control of the VCO as well as a -99. I recommend you replace it with an RCI8719-99 or MMB8719. You’ll be much happier with the results. All Intellectual Property, as defined below, owned by or which is otherwise the property of LesComm or its respective suppliers relating to the LesComm kits, including but not limited to, accessories, parts, or software relating there to (the“Expa Kit System”), is proprietary to LesComm and protected under federal laws, state laws, and international treaty provisions. Intellectual Property includes, but is not limited to, inventions (patentable or unpatentable), patents, trade secrets, copyrights, software, computer programs, and related documentation and other works of authorship. You may not infringe or otherwise violate the rights secured by the Intellectual Property. Moreover, you agree that you will not (and will not attempt to) modify, prepare derivative works of, reverse engineer, decompile, disassemble, or otherwise attempt to create source code from the software. No title to or ownership in the Intellectual Property is transferred to you. All applicable rights of the Intellectual Property shall remain with LesComm and its suppliers. NOTE; ONCE INSTALLED A LESCOMM KIT CANNOT BE RETURNED. 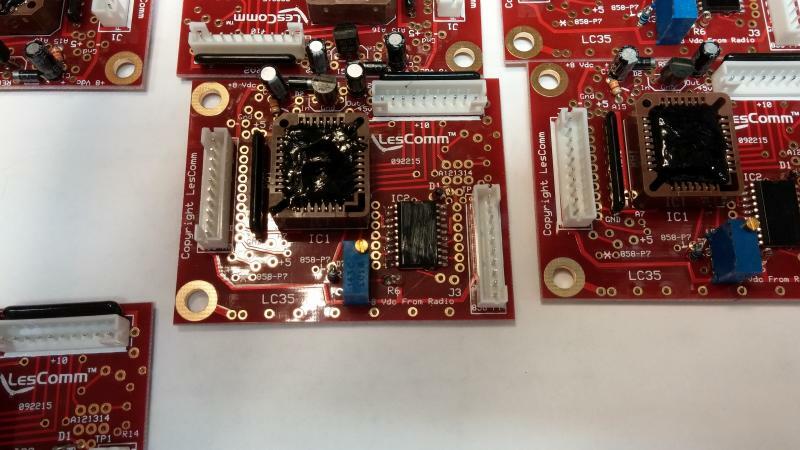 However, all LesComm kits come with a lifetime warranty. We will repair or replace the kit at our discretion﻿. Simply return the kit to us. Kit failure due to incorrect installation is not covered. Copyright Lester's Custom Truck Shop. All rights reserved.